The appellation Crémant de Bourgogne Contrôlée was created by a decree on the 17th October, 1975. The base wine for Crémant de Bourgogne Rosé comes from pre-selected vines within the Burgundy region. 100% Pinot Noir. Following a draconian hand sorting of the grapes they are immediately pressed. A gentle and slow pressure is used in order to extract the very delicate salmon pink color from the pulp. Delicate, long-lasting bubbles are proof of this traditional, bottle fermented, quality sparkling rosé burgundy wine. The first impression in the bouquet is of brioche followed by aromas of blackcurrants and redcurrants. Rich and long lasting flavors follow. 7 to 8°. Served as an aperitif or with many dishes such as fish or poultry. Particularly attractive when served with fresh fruit desserts. It is the perfect wine for receptions. Made in the traditional method of bottle fermentation over 12 months. De-gorging, dosage de depart and the final cork is then inserted. Can be stored for many years in a dark, cool place. 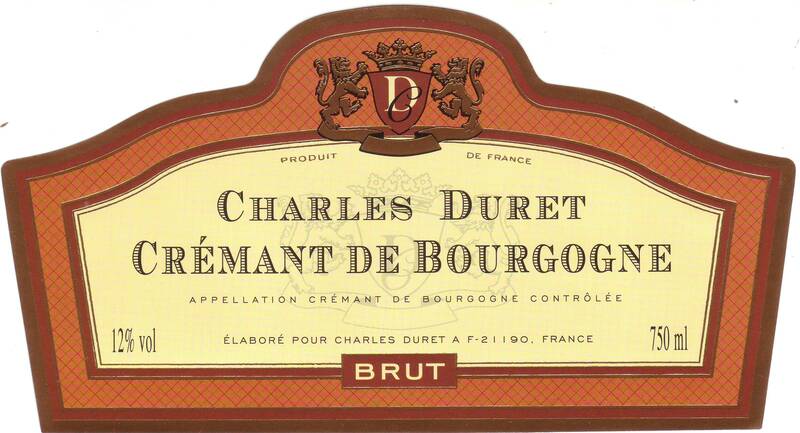 Charles Duret is a special project from Vincent Sauvestre for his Sparkling wines. In 2003 he took over this Estate (formerly Moingeon, La Maison du Crémant). The grapes are today harvested by hand and are transported in pierced cases to the presses.The juice is fermented in temperature-controlled stainless steel vats. The wines are then elaborated with the blending of two grape varietials: Chardonnay and Pinot Noir for the Crémant Brut and 100% Pinot Noir for the Crémant Rosé. The next stage is the creation of effervescence: the wines are bottled and yeast is added, allowing the second fermentation process to begin, in keeping with the principles of the traditional Champenois method. Depending on the lots, the effervescence process in the bottles will last between 10 and 20 months. The last stage is the disgorging of the bottles, followed by the addition of a liqueur. The vineyards are located in the Yonne and the Hautes Côtes, which contribute to their freshness and crispness, to which they add grapes from the Mâconnais, which provide a more pronounced wine flavor and aromatic strength.